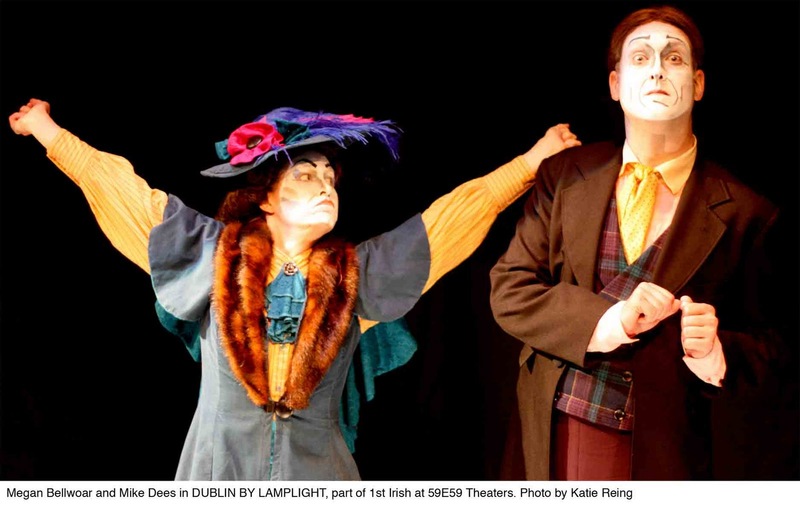 A combination of commedia dell'arte and an Irish history lesson, with political posturing and old-fashioned melodrama thrown in, Inis Nua Theatre serves up the intriguing Dublin by Lamplight by Michael West as part of 2011 1st Irish Festival at 59E59 Theaters. A valiant try, with the company and creators having invested much emotion and enthusiasm in the project, the final effort is sadly rather lackluster with a story that literally runs helter-skelter rather than concentrating specifically on what it wants to say. In 1904 Dublin, on the day the King is set to visit the city, playwright/producer Willy Hayes (Jered McLenigan) is getting ready to have an important meeting with his patron, Eva St. John (Megan Bellwoar) where she will sign a lease which will give life to his dream of the National Irish Theatre of Ireland. Their first project under that banner will be Willy's play "The Wooing of Emer," which is slated to begin performances that very night. However there are multiple complications on the horizon. Eva, a political suffragette, is passionately interested in pursuing her agenda via the stage, not to mention having a more than professional relationship with Willy. Willy on the other hand, just wants to get the theatre up and running. In the meantime, Willy's brother Frank (Jared Michael Delaney), one of the actors in the play, seems to have his own ulterior motives in all this. There's also Maggie (Sarah Van Auken), the pretty costume designer, who's carrying a torch for an important man in her life, while set painter Jimmy Finnegan (Michael Doherty), has his own lovesick eyes set on Maggie. Unfortunately the story ends up becoming so scattered, it never really takes hold. While there are more than a few flashes of both brilliance and emotional depth, from Maggie's worrying about her future, to Frank's being temporarily diverted from his purpose by the sight of a little boy; the play ultimately tries to cover too much ground and, as a result, oftentimes feels meandering and lost. Among the casualties of this process is much of the political emphasis. Never really explained except in the simplest of terms, more is needed to make it really resonate. Or, when the various issues do start to come to the fore, their plot thread is quickly dropped or passed over. The playwright also seems to have been unable to decide which point of view to take or which character to follow, this indecision also hurting the overall story. Another problem is the structure of the play itself. Running only 90 minutes in length, the show goes on approximately twenty minutes too long; with scenes towards the end seemingly tossed in that don't need to be there. The play also contains an intermission that isn't needed, and which only serves to further slow everything down. An interesting touch was having all of the actors wear white painted masks. Distracting at first, it actually helps to show the versatility of the performers as they keep changing characters. All told, 30 people are brought to life by six actors. Most of the on-stage personas are quiet believable, making it a shame that the players are hamstrung by a script that throws in everything but the kitchen sink. The acting is quite good. McLenigan makes a fine Willy, a man who just wants his dreams of a National Theatre to become a reality. Van Auken is particularly touching as Maggie, a young girl who has hopes of becoming an actress, while in love with someone who may not love her back the same way. Bellowar is fine at Eva, the wannabe fire and brimstone agitator, who also has perhaps a bit of hypocrisy in her possessiveness of Willy and her endless determination for a place on the stage. After all, does it really matter who delivers the message as long as it's delivered? Delaney cuts an interesting figure as the tormented Frank, and Doherty is fine as the lovelorn Jimmy. Your heart will ache for Jimmy during a rather poignant scene concerning a rose. Mike Dees rounds out the cast nicely as the journeyman actor Martyn Wallace, among others. Direction by Tom Reing is fine up to a point. He has a firm grasp of the characters and the various situations depicted, but he's unable to integrate the stage production with the effusiveness of the text, which ends up bringing the potential of the story to a screeching halt more than once. Set by Meghan Jones, recreating elements of an old-style theatre, works nicely. Costumes by Maggie Baker are very good and fit the various personalities of the multiple characters. Lighting by Terry Smith is appropriate throughout. 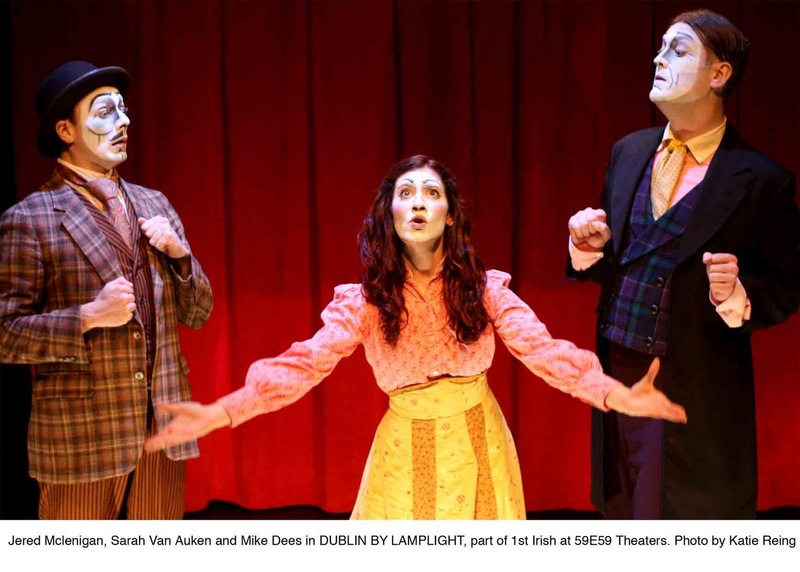 Dublin by Lamplight represents an interesting effort, but one which ultimately comes up short. Though I dare anyone who has seen the movie Dodgeball to think of the phrase "The National Irish Theatre of Ireland" without smiling.